A flyer in the lobby of Warm Springs Animal Hospital, where I took my dog Aja to see her vet this morning, reminded me of the recent feature I wrote on Best Friends Animal Sanctuary for Desert Companion. The flyer wasn’t about Best Friends, though. It was about The Animal Foundation, which was also mentioned in my story. I recalled the 2007 disease outbreak at Lied Animal Shelter, which the foundation operates, as part of the backdrop against which Best Friends began reducing its mobile adoptions from its Sanctuary in Kanab, Utah, to Las Vegas. I also cited Clark County Animal Control statistics on animals impounded and euthanized at Lied as evidence that Best Friends’ help is clearly needed in our area. The foundation receives 50,000-plus animals each year. In 2009, it took in 2,000 more dogs and cats than Animal Care and Control of New York City. It takes in 136 animals daily, on average. Only 13 percent of animals placed in Las Vegas homes come from shelters or rescues; 9 percent come from the foundation. 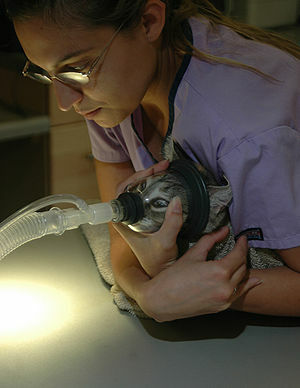 The foundation performs 8,000 spay or neuter procedures annually. According to the flyer, the number of spay and neuter operations will rise by 4,000 annually starting this year, due to the opening of a new public spay and neuter clinic. Although the animal welfare world is divided on the best cure for pet overpopulation, at least one person I interviewed for the story thinks spay and neuter laws are the answer. Holly Stoberski, who was on Clark County’s Animal Advisory Committee through 2010 and is on the board of local Heaven Can Wait Animal Society, told me that she believes ordinances such as Las Vegas’ Code 7.14, adopted in 2009, will help reduce the number of unwanted pets in the valley. As with so many well-intentioned laws and services, the success of 7.14 and Lied’s clinic will depend on enforcement and marketing, respectively. If my neighborhood is any indication of citywide norms, Las Vegans think it’s perfectly acceptable to let their unaltered dogs roam the streets with no identification. Placing flyers in veterinary clinics is preaching to the choir; let’s hope The Animal Foundation is doing much more to get its message to those who are filling its intake rooms with 136 animals per day. © Heidi K yser and HeidiKyser.com 2012. Unauthorized use and/or duplication of this material without express and written permission from this blog’s author and/or owner is strictly prohibited. Excerpts and links may be used, provided that full and clear credit is given to Heidi Kyser and HeidiKyser.com with appropriate and specific direction to the original content.